Once described as "the Rolling Stones of Irish Traditional Music," the legendary group De Danann, returned to the festival stage in 2009 with a new album ‘Wonderwaltz’ and trips to Finland, Switzerland, Denmark, Italy and the USA. The band have found themselves once again in hot demand by promoters in Europe and the USA. 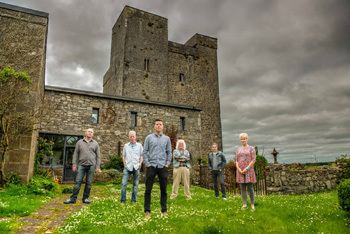 Founding member Alec Finn is joined by Eleanor Shanley (vocals), Derek Hickey (accordion), Brian McGrath (banjo/piano), Ronan O'Flaherty (fiddle) and Neill Lyons (bodhrán). De Danann were formed in 1975 in Galway and became one of the most influential bands in traditional Irish music before going their separate ways in 2003. The group released their debut album ‘De Danann’ in 1975 and in total have recorded 14 albums including ‘Anthem’, ‘Star Spangled Molly’, and ‘A Jacket of Batteries’ and achieved chart success, with many of the albums reaching gold and platinum status. Famous for their cross cultural experiments they recorded Irish versions of The Beatles ‘Hey Jude’, Handel's ‘The Arrival of The Queen of Sheba’ which they called ‘The Arrival of The Queen of Sheba to Galway’. They also recorded Jewish Klezmer music with Andy Statman and made an album called ‘Half Set in Harlem’ featuring American Gospel singing. Their distinctive approach to the tradition both musically and vocally have been the cornerstone of Irish music for over two decades and is also evident on their latest album 'WonderWaltz'. On ‘WonderWaltz’ De Danann succeed yet again in reaching a standard of excellence. The album captures the current climate of 'recession and depression' expressed succinctly in ‘Hard Station’, but offering hope in ‘Ireland’. We’re reminded of our true riches in the haunting melody of ‘Inis Oirr’ and all are woven beautifully together by the jigs and reels played skillfully by the musicians that are De Danann. A founding member of De Danann, Alec Finn has been integral to the arrangement and production of all the groups' albums and live performances. In distinct contrast to the vast majority of Irish musicians, he plays a round-backed Greek bouzouki; one of the older style trixordo three course (six string) instruments tuned DAD. Alec’s solo album is entitled: "The Blue Shamrock" - Irish airs played on guitar and bouzouki. He has taught master classes at The Irish World Academy of Music in the University of Limerick, the Zouk Fest in New Mexico, and at the Catskills Festival of Music in New York, accompanied by Mary Bergin. One of Ireland’s foremost female vocalists, Eleanor Shanley, from Co. Leitrim, is renowned for her unique interpretation of Irish and roots songs. Since her first appearance with De Danann in 1989, and subsequently with the inimitable Ronnie Drew, Eleanor’s popularity has soared on the Irish circuit. Tour appearances have included Christy Moore, Sharon Shannon, among many others. She is much in demand as a soloist at top music festivals, both in Ireland and abroad. Eleanor has collaborated with Ronnie Drew, Sharon Shannon, Dolores Keane and The Dubliners to name but a few. Eleanor has also recorded many solo albums, among them "Desert Heart", "Eleanor Shanley" and "A Place of My Own". Ronan O'Flaherty hails from Galway City in the West of Ireland. At the age of nine he started playing fiddle, which continued into his teenage years, where he gained valuable experience in Tigh Coilí, the family pub in Galway City. Tigh Coilí is renowned and recognized by local and visiting musicians for its lively and crowd-pleasing sessions. Ronan recorded a duet album with Co. Clare concertina player Edel Fox in 2006 and has collaborated on various other albums. As a native Irish speaker, Ronan works extensively for Irish language TV channel TG4. He also teaches music in Galway City and the surrounding areas passing on his talent to young fiddle enthusiasts. Ronan also spends considerable time travelling worldwide teaching music workshops. Brian McGrath originates from Brookeborough, Co Fermanagh in Northern Ireland, an area steeped in traditional Irish music. He started playing piano at the age of five and later progressed to the accordion, banjo and mandolin. He has toured the world extensively and has played with traditional Irish music veterans including Noel Hill, John Carty, Matt Molloy, Paul Brock, Frankie Gavin, Charlie Lennon, Joe Burke, Sean Maguire, Brian Rooney, Cathal Hayden, Joe Derrane, Arty McGlynn, Alec Finn, lan Kelly, Dolores Keane and Steve Cooney to name but a few. As well as doing extensive TV and media work he has played on over 120 albums to date. Neill is from Bayside in Dublin's Northside. He learned music from an early age under the guidance of piper Mick O'Brien and his wife Fidelma. From the mid 90's right through the new millennium Neill played and toured with many bands and groups including Delos, Sessions from the Hearth, and the Gavin Whelan band. In 1999 Neill played on Ronnie Drew’s album 'The Humour is on me Now'. Following the release of Neill's critically acclaimed solo album 'Skins and Sins' in 2008, he has since appeared with Altan, Damien Dempsey, Slide, and most recently The Bonnymen, of which Neill's two younger brothers Barry and Conor are members. Neill plays regularly in the Dublin traditional Irish music scene, where he is in great demand for both live performances and recording. Hailing from Adare, Co Limerick, both Derek Hickey’s grandfathers played fiddle. Derek’s own musical career began at ten years of age when his uncle left an accordion in the family home. At 18 he joined the band Arcady and then at 21 was invited by Frankie Gavin to join De Danann. He recorded two albums with the band during this time. In addition to performing, Derek is also a regular tutor at The Irish World Academy of Music and Dance in the University Limerick. In his rich and varied performing experiences, he has shared the stage with some of the world’s greatest talents including Stéphane Grappelli and The Rolling Stones.